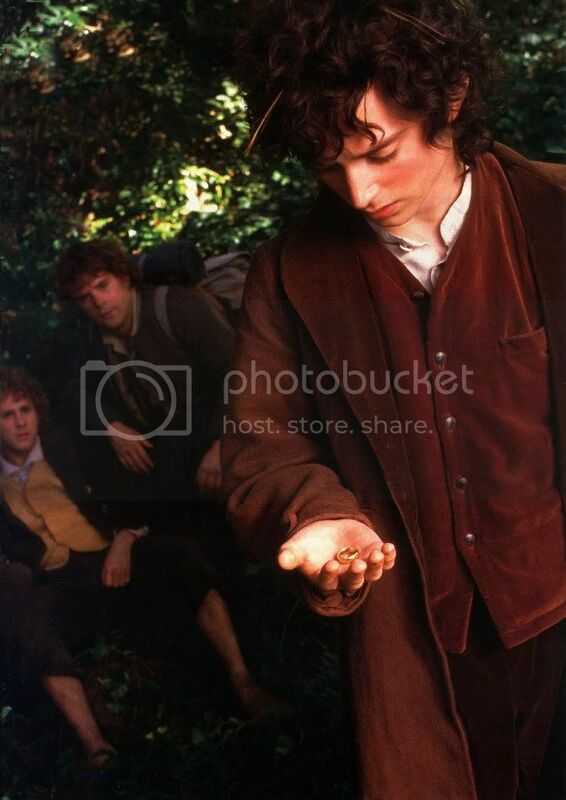 ~ Frodo before a tree, and Frodo on the road holding the Ring, from the Feb-Mar 2002 premiere issue of the LotR fan magazine. These two are both beauties. Again, I have several copies of these saved from around the internet, but they were small and not that clear. I must again thank my dear spouse for the scanning. You are welcome, Mews. I hoped others would find them as lovely as I, even though they'd seen them all before. look at the straw in his hair. Gives me all sorts of ideas. I had never seen it, either, Art of Fic, except as incorporated into a clever wallpaper depicting Frodo and Elijah, complementing each other. I was thrilled to find the original, you may be sure: and so large! 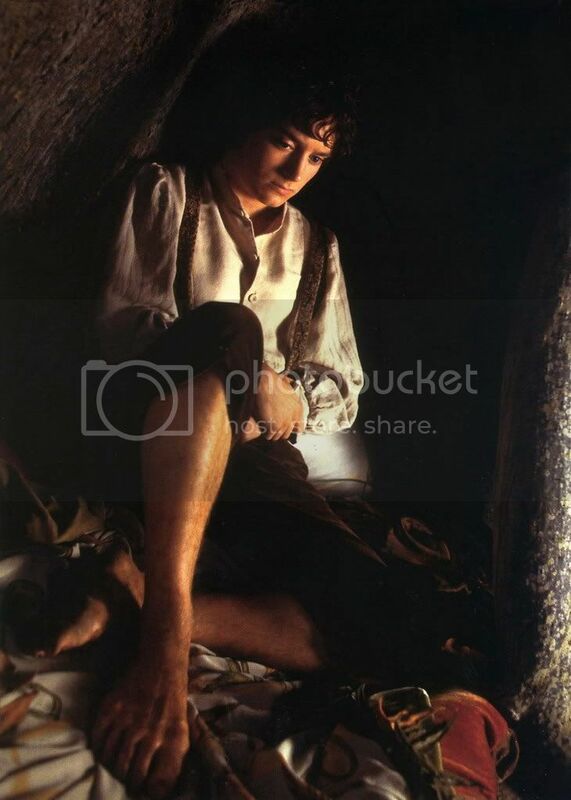 That really is a lovely image of Frodo. I know it's "only" a publicity still, but I thought it captured a lot of Frodo. I have always believed in God, but sometimes when I see how beautiful Frodo is(and not just on the outside! ), I believe in God even more. I think God really worked overtime when he created Elijah Wood. Lordy. is so incredibly beautiful. I also adore the one with the straw in his hair(I also get ideas, lol)... and I'd give my left arm for his SKIN. Sigh. Oh well... thanks for all the good excuses for deep breathing -- it's very healthy, you know --lol!!! Tonight I watched the first of the Costa Botes documentary segments, the ones that come with the new LotR DVD's. I watched the one on the FotR disk. Yup, I had to make some screencaps. Yes, the skin was excellent in these, too. I hope to post them some time. That is indeed Frodo. Audible Sigh! I love those hairy feet too - Scorchio! Whenever I look at the image, I *should* be thinking of drawing him out, offering verbal reassurance and consolation. But, in fact, I just think of sliding my hands up his pants-legs.